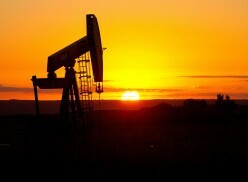 Oil markets have gotten to some bullish news. 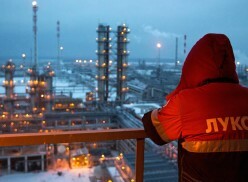 OPEC says its members have cut a deal to slash global oil supplies by at least 1.2 million barrels per day (mbd), and possibly much more if Russia follows through on its promise to cut. This will go a long way toward helping to shore up oil prices for at least the next several months and will also initiate a sizeable drawdown in global crude inventories, which have swelled by as much as a billion barrels amid the glutted post-2014 oil market. But wait, you say. The long-term trends are still bearish. There is far more oil available, and at a much lower price, than almost anyone expected as recently as three years ago. There are even rumblings that investment cuts in more complex projects might not lead to the tighter oil markets once expected by decade’s end. And worse, global gasoline demand has peaked and oil markets should brace for a new cycle of slow growth, forcing all those new barrels to squeeze their way into a smaller market than once expected. The consequences are easy enough to infer. 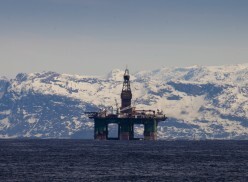 Low prices and weak profits for oil companies. A moment of reckoning for petro-states. And possibly a much-needed break for the climate. The latest rumors of oil’s demise may be greatly exaggerated. Well, maybe. Without question, big changes are underway that likely signal a challenging outlook for the industry, especially for the oil majors—something I have written about before. But the latest rumors of oil’s demise may be greatly exaggerated. It’s true that recent projections from the International Energy Agency (IEA) show a pretty substantial slowdown in the rate of global oil demand growth in the coming decades, especially when compared to the past 30 years. But those projections rest on a few big assumptions that upon closer examination should give a little hope to the oil bulls. First, IEA’s primary forecasts assume countries follow through not just on current policies, but also on announced and committed polices like those made as part of the Paris Climate Agreement. This may well be a reasonable assumption, but it warrants mentioning, especially in light of the recent U.S. elections in which the incoming president vowed to withdraw from the agreement. 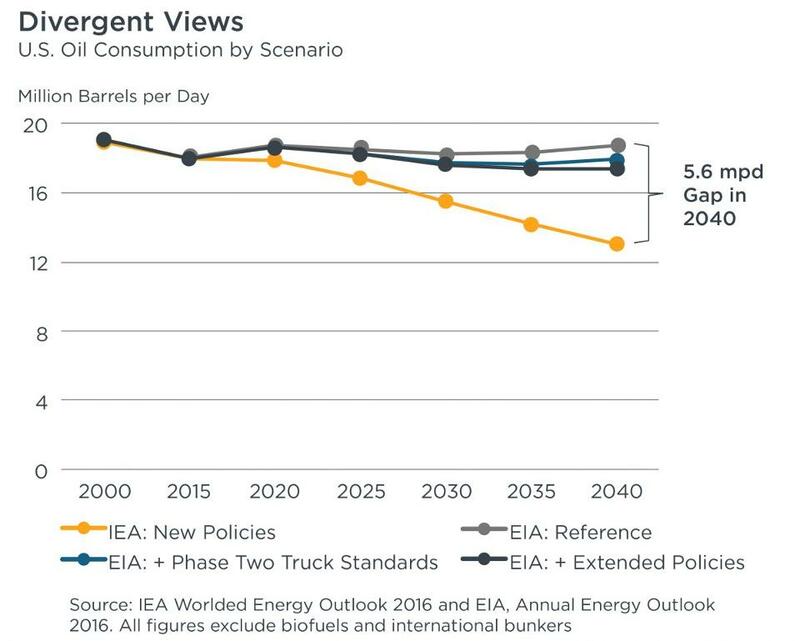 In the event that countries fall back strictly on existing policies, global oil demand in 2040 would top 120 mbd instead of the 107 mbd in IEA’s primary scenario. Assuming countries follow through on committed and announced policies, IEA is expecting a sharp drop in oil demand across developed countries, especially in the United States, where demand falls from 18 mbd in 2015 to just 13.1 mbd in 2040. The last time American oil consumption was that low was 1968. Interestingly, the shift IEA envisions is not largely driven by new technology. The agency predicts electric vehicles will make up just 8 percent of the vehicles on U.S. roads in 2040. Rather, it seems largely driven by other factors like reduced travel demand and large efficiency gains. If U.S. oil demand looks more like EIA’s projections instead of IEA’s, that alone would push future global demand growth trends significantly higher. Is this likely? U.S. government forecasters don’t seem to think so. In its latest long-term projections, the Department of Energy’s Energy Information Administration (EIA) sees U.S. oil demand holding steady through 2040 as modest declines in transport growth are offset by strong industrial demand growth. 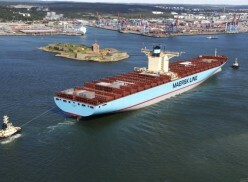 Even in the case where new policies like the Phase Two Standards for heavy-duty trucks are fully enacted and existing policies like passenger vehicle standards are extended past expiration—outcomes that are now much less likely with a new Republican Congress and White House—EIA sees U.S. demand at a healthy 17.5 mbd in 2040. That trend-line looks much more consistent with what we have seen over the past few years, as low oil prices have triggered record U.S gasoline demand amid surging vehicle travel and stalled efficiency gains. 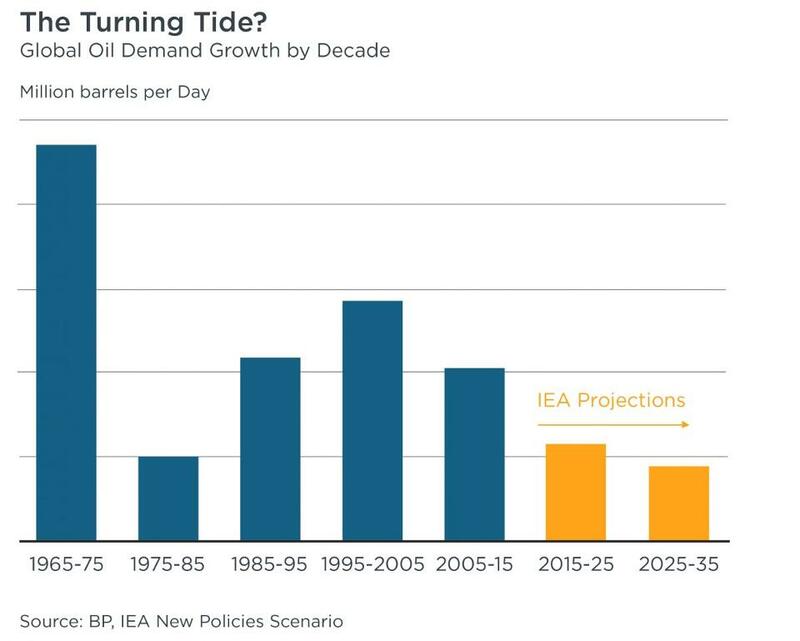 If U.S. oil demand looks more like EIA’s projections instead of IEA’s, that alone would push future global demand growth trends significantly higher. Yet, the assumptions underpinning IEA’s outlook that are perhaps most surprising and subject to uncertainty come outside the developed world—most notably in China, where the agency sees oil demand growth effectively petering out after 2020 if China is to meet its announced policy commitments. In fact, after record-breaking growth there upended oil markets from 2000 to 2015, IEA now sees Chinese oil demand plateauing at 15 mbd and failing to ever come close to current U.S. levels despite China’s substantially larger population. This feels like a stretch. 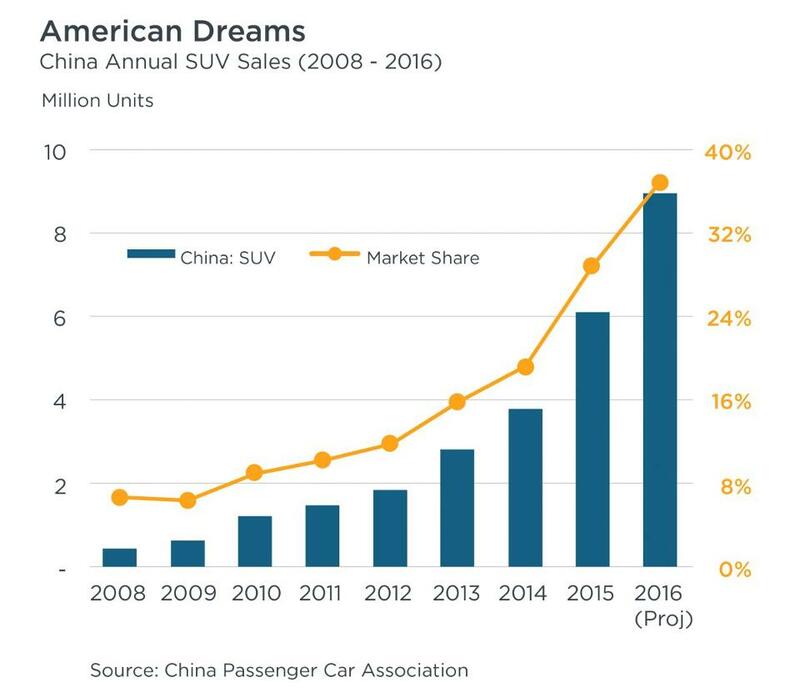 Consider first that despite rapid growth in auto sales over the past several years, the number of passenger vehicles per 1,000 people in China stands today at just 90—about the level it was in the U.S. in 1920. 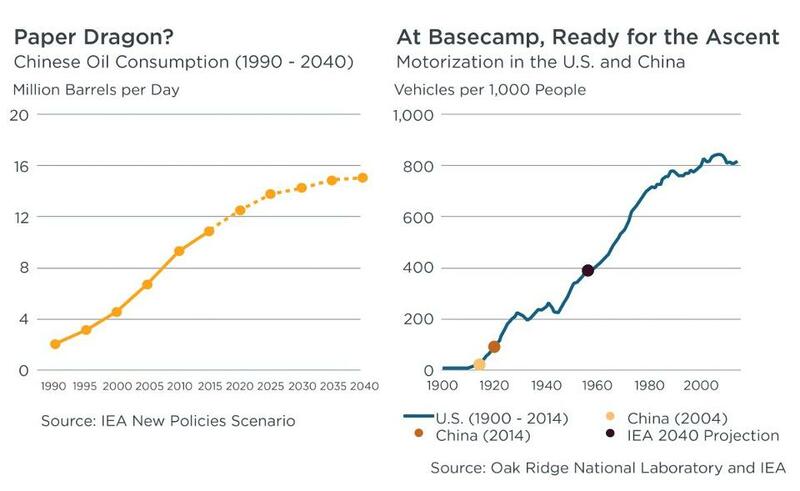 By 2040, IEA sees Chinese vehicle ownership reaching U.S. 1950s levels. True, for China to reach current American motorization levels, the country would have to squeeze about a billion cars and trucks on the road compared to about 250 million in the United States, an unimaginable outcome if you have ever experienced Beijing traffic. But it’s also true that there is no reason to believe Chinese consumers will settle into a dramatically different growth pattern than American consumers. As they get richer, their lifestyles tend to converge toward ours. Today, American-style SUVs and even pick-up trucks account for nearly 40 percent of the Chinese vehicle market, with sales on pace to top 9 million units this year—only slightly behind the projected record-breaking total of 10 million in the U.S. Anyone who doubts this should take a look at China’s rapidly expanding market for light-trucks. Just a few years ago, these vehicles were nowhere to be found in China. 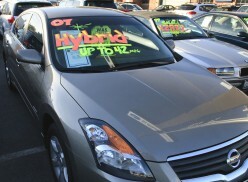 But today, American-style SUVs and even pick-up trucks account for nearly 40 percent of the Chinese vehicle market, with sales on pace to top 9 million units this year—only slightly behind the projected record-breaking total of 10 million in the U.S. That shift has already had an impact on fuel markets, with 2015 seeing the fastest growth in Chinese gasoline demand in history and 2016 not far behind. A flattening out of demand growth doesn’t seem to square with that. It’s possible that competition will dramatically change the trajectory of oil demand in China. 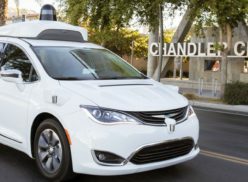 IEA figures there will be about 60 million electric vehicles on the road there in 2040, equal to 11 percent of the fleet. In total, alternative fuels will meet almost one-fifth of China’s transport fuel needs in 2040, up from just 9 percent today, according to IEA. That’s impressive, but it’s also debatable. Can the Chinese EV industry mature fast enough to meet expectations? Where will all those electric vehicles charge in dense Chinese cities where high-rise living is the norm and few vehicle owners have access to dedicated parking for EV charging? And how many Chinese consumers will open their wallets for vehicles that IEA itself says carry at best a 10-year payback? The past two years have reminded many observers that black gold is tough to beat, no matter what commitments countries make, and that countries like China still have a lot of room to grow. 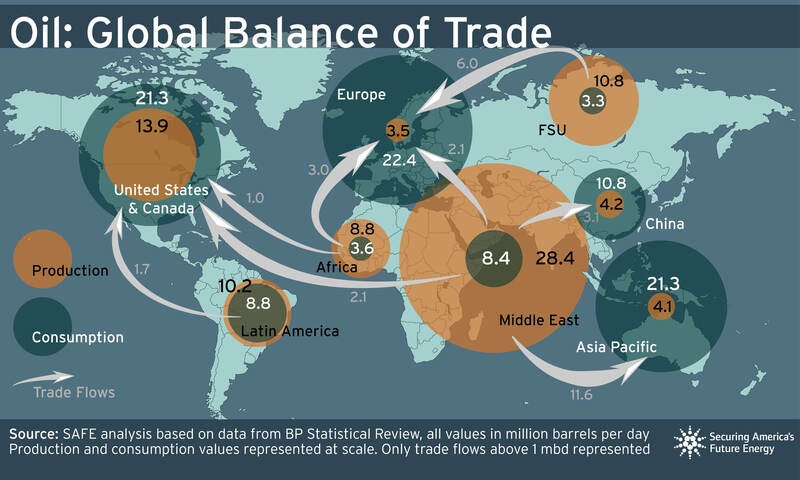 It’s not hard to put together a picture that spells real trouble for the oil industry in the coming decades. There are incremental shifts around the edges of key markets, competing technologies are getting cheaper, and countries have made some ambitious policy commitments that they can’t reach without far fewer barrels. And yet, it may be too soon to write oil’s obituary. The past two years have reminded many observers that black gold is tough to beat, no matter what commitments countries make, and that countries like China still have a lot of room to grow. Maybe more than anything, today’s OPEC decision reflects the cartel’s belief that oil has plenty of good days yet to come.